This Administrative Professionals Day send a Gourmet Gift Basket filled with Gourmet Snacks, Luxury & Relaxation Gifts and more! Gourmet Gift Baskets that will let the Professional in your life know how much you appreciate and admire their hard work and commitment to excellence! All of our Administrative Professionals Day Gift Baskets! 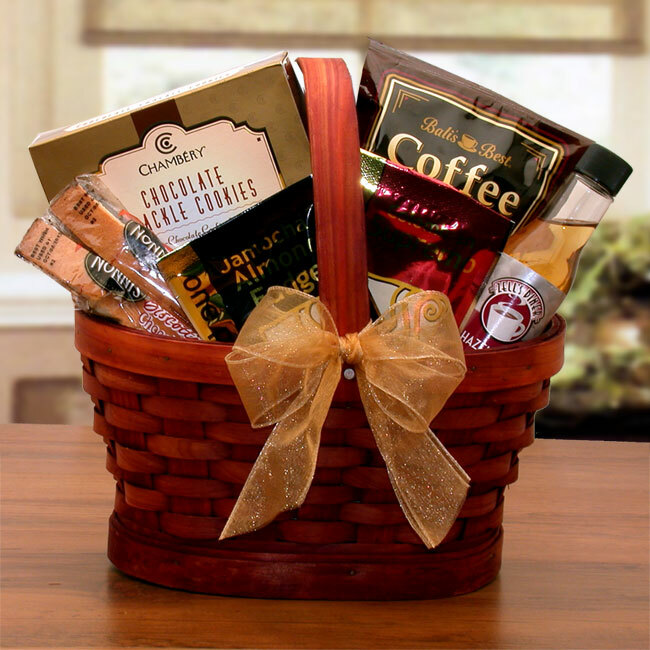 Bountiful Favorites Gourmet Snacks Gift BasketA sumptuous gift basket made of hand-woven natural willow in two tones. Brimming with an abundance of savories and sweets like Tavolare sweet-n-salty snack mix, Monterey Jack cheese spread, Los Olivos Wine & Cheese Biscuits, Parmesan flatbread crisp crackers, deluxe mixed nuts, Dill seasoned pretzel nuggets, chocolates and much more! Traveling Gourmet Treats Gift TowerThese stylish faux leather suit cases are "suitable" for anyone who loves the classy things. Each suitcase is filled to the brim with delicious gourmet foods and snacks, and arrive stacked, and bound with matching ribbon. Spa Luxuries Gift BasketThe Spa Luxuries Basket is a gift of invigorating Cucumber & Melon essence that soothes the skin and the senses. They’ll coo over creamy body butter, refreshing body Spa scrub, luxuriant body lotion and the other body care products that both rejuvenate the spirit— and slightly spoil it. You may have to buy a basket for yourself. Caramel Spa Treasures Gift ChestA sweet and soothing caramel and cream scent wraps you in its comforting embrace, healing tired skin (and spirit) from head to toe. An entire ensemble of spa-quality indulgences, from bath fizzies to exfoliating scrubbers, leaves you feeling relaxed, refreshed and ready to greet the day! Enclosed in a wooden keepsake chest this gift is the ultimate in spa experiences. Lavender Sky Ultimate Bath & Body Tote Send her an indulgent spa experience right at home with this exquisite spa gift basket featuring Lavender Sky products. Known for its fresh floral aroma and naturally soothing properties, lavender has been used for relaxation and restoration since ancient times. With a sophisticated and subtle blend of sweet lavender. Magnolia Blossoms Spa & Bath Gift PackageThis extravagant collection of deluxe Spa body care products refreshes the body and mind with an aromatic blend of natural magnolia. The fragrant blossom fuses with essential oils to work soothing magic throughout the body lotion, exfoliating shower gel, bath gel and more.